Have a Late Tax Return? If you haven’t filed your taxes for years and you don’t have the records or bookkeeping necessary to file those taxes, you don’t need to worry. JG Tax Group has the knowledge and expertise to recreate multiple years of past tax returns for you in 24 hours, rather than weeks or months. One of our clients had a complicated situation needing a total of 97 tax returns prepared. They included several years of 1040s, corporate 1120s and payroll tax forms (941/940), which were all completed in just 3 days. We can supply all the tax help you’ll ever need. Are you worried about the IRS coming after you for your unfiled tax returns? Many companies use scare tactics to lure you into using them to file your unfiled tax returns. However, the fact is that in 99.2% of cases, the IRS doesn’t actually follow through with prosecution. The most important thing is having these returns prepared and filed correctly. JG Tax Group’ team includes tax attorneys that put together your returns correctly by obtaining them from the IRS to see exactly what information they have concerning your income. The worst thing you could do is file your tax returns and fail to show 1099s and W2s that you received several years ago. This is the main reason why it is essential to have JG Tax Group pull your history from the IRS to see exactly what income has been reported on your behalf. The IRS punishes celebrities like Wesley Snipes simply to scare the average taxpayer into filing and paying their tax returns on a yearly basis. While in the limelight, Snipes told the government he did not file because he felt he did not have to. The government didn’t agree and consequently sentenced him to 3 years in prison. The IRS has several ways to figure out which taxpayers have not filed their taxes. They now team up with a number of states to combat tax avoidance. The IRS checks state records to see if you did not file your federal returns. With the superior technology these days, the IRS has updated their computer systems. On a daily basis, these systems verify which individuals have returns that are missing for certain years. This is the reason why they are able to catch more people that have not filed taxes in several years. Everyone has a reason as to why they were unable to file their taxes. Many people state that they didn’t know they had to file, they forgot to file, they thought somebody else filed for them or they filed for an extension. These reasons will not matter to the IRS. Their job is solely to get you to file your taxes so they may assess high penalties and interest to collect from you. The only way the IRS can assess taxes against you is if you file your own tax returns or if the IRS files a substitute return on your behalf. The IRS will generally file a substitute return for you if they have a record that you earned income, but there has been no return filed within two years. You certainly don’t want the IRS to file a return on your behalf. The IRS will include all of your income, but will purposely fail to include all of your deductions, which results in owing more money than you actually need to pay. If the IRS has filed substitute returns for you, the solution is to simply to have the JG Tax Group prepare correct returns for you to bring your debt to a lower amount. When the IRS catches up with you, they will send you an automated letter asking you to file the years that haven’t been done yet. In more severe cases, your file will be transferred to an IRS Revenue Officer. Everything then becomes much more complicated. Revenue Officers are very aggressive and have the ability to audit you as soon as they receive your returns. If you have received an automated letter, we highly suggest that you have JG Tax Group prepare these unfiled taxes before your file is sent to a Revenue Officer. The IRS will require that you file your tax returns immediately. In most instances, this is difficult to accomplish, especially under the wire. Fortunately, JG Tax Group is able to file your tax returns within 3 business days, including essential forms, like a 1040, 941, 1120, 1120 and 1065. 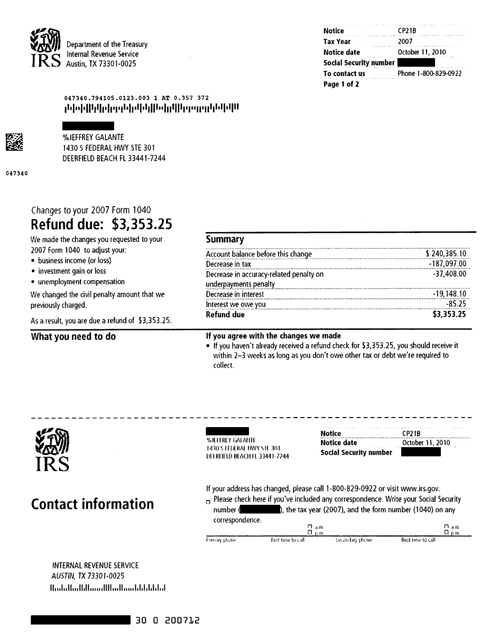 JG Tax Group has a direct portal into the IRS’s computer system. This allows us immediate access to your confidential records without raising any red flags. Our knowledge of the IRS gives us the background required to grant us access to confidential taxpayer records. After your unfiled returns are processed by the IRS, you may have additional taxes that you owe. If you can’t pay these taxes, we can provide you with a few options. With our services, we can possibly have you declared currently non-collectible, submit an offer in compromise, negotiate an installment agreement or even file for an abatement of penalties. As you can see, you need to contact the highly experienced team at JG Tax Group immediately to handle all your tax return needs. Below you will find some examples of actual results we got for our clients and how re-filing tax returns can dramatically lower your debt.